Don't even think of bugging me about anything come February 9th 'cuz I've already cleared my calendar for that date and Lord willing I'll be spending all of it immersed in BioShock 2. And at last 2K Games has revealed the cover art for the hotly anticipated sequel to the 2007 original first-person shooter that blew minds and won awards all over the place. 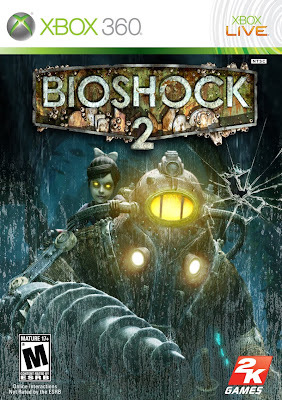 I'm really digging the BioShock 2 logo: more decrepit than the one for the first game and now encrusted with barnacles and other sedentary sea life. And look: the Big Daddy is so ticked-off that he's smashed a crack in the game's cover! But what's seriously wigging me out is that... thing... to the left of the Little Sister's head. Is that a group of fish or someone's face? Just two and a half more months before we get to return to Rapture! That's nothing compared to this, Chris.